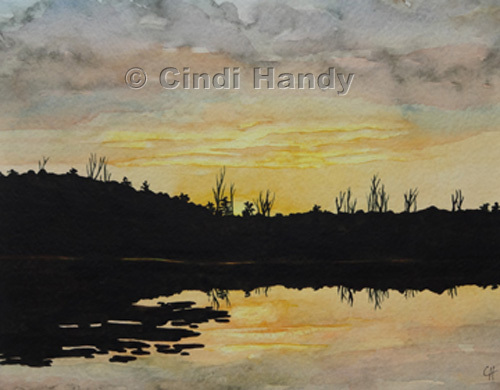 This image is entitled Sunset on Round Lake and is the last of my paintings for my one-woman show at the Wesley Gallery (131 Lawrence Street, Saratoga, NY). The show will open next Monday, March 2nd and run through March 31st. This will be my largest show yet, with 28 paintings on display! This entry was posted in Art Show, Water and tagged Art Show, lake, watercolor, Wesley Gallery. Bookmark the permalink. I like the way you can just see some of the shore line in the darkness as it adds mystery. Beautiful work! Thanks so much for viewing my work!